ROSE BACKROAD Ultegra Di2 | Din drømmecykel – kun hos ROSE Bikes. A gravel bike is suited for gravel grinding and allows you to ride everywhere a classic road bike would have its difficulties. Therefore, the BACKROAD GRAVEL features the 38 mm wide G-ONE Allround Evo tyres by Schwalbe, impressing with extremely low rolling resistance and a Classic Skin look. 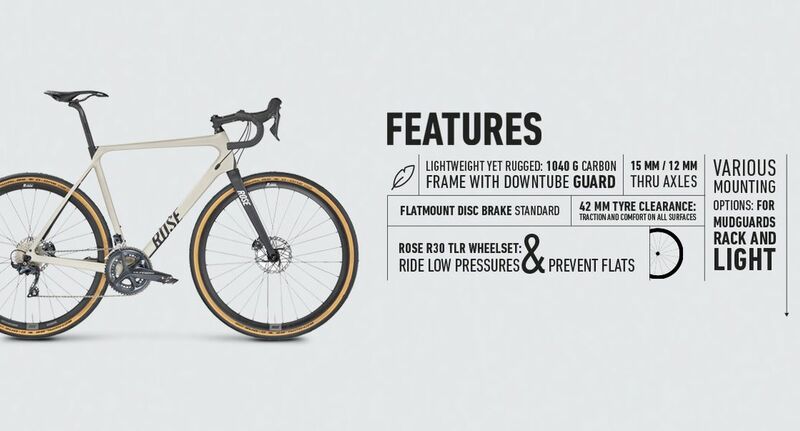 For additional comfort, the gravel bike accommodates tyres with a maximum width of 42 mm. The combination with lightweight, robust ROSE R Thirty Disc wheels promises speed and comfort on any gravel path. The ROSE RC-170 Flex carbon seat post skilfully absorbs unpleasant shocks; the Ritchey WCS Evomax bar provides freedom of forearm movement and greater leverage when in the drops. True to ROSE's philosophy, you can choose between different groupsets: Shimano Ultegra and Ultegra Di2, SRAM Force or Shimano 105. Habe die Ausstattung exakt wie das Grand Turismo gewählt. Es sieht einfach fantastisch aus wenn man auf den Retro Look steht. nur an die Shimano Ultegra Di2 musst ich mich erst noch gewöhnen. Das Kabel vom Akku in der Sattelstütze muss wirklich deutlich hörbar fest in das Kabel vom Rahmen einrasten. Leider ist es mir passiert das ich das Kabel nicht fest genug eingerastet habe und bin im Anschluss an der Schaltung schier verzweifelt da Sie mal funktioniert hat und mal wieder nicht. Hierdurch habe ich dann wirklich einige Stunden verplempert. BACKROAD Force eTAP AXS 26.599,31 kr. BACKROAD Ultegra Di2 25.034,19 kr. BACKROAD Force 1x11 19.947,53 kr.